Sometimes its the long and silent fights which are the most beautiful and real ones. Tales of genuine masculine tenderness and feminine resilience which best showcase what love and humanity should aspire to. Jeff Nichols is an American director and writer. He has a really clear sense of timing and genre. Having directed just five films in the past ten years, his track record is quite good and ranks him in with the best and brightest of his generation. Something that I particularly enjoy about his films is that he likes to use one of my favourite actors, Michael Shannon, in each film he directs. 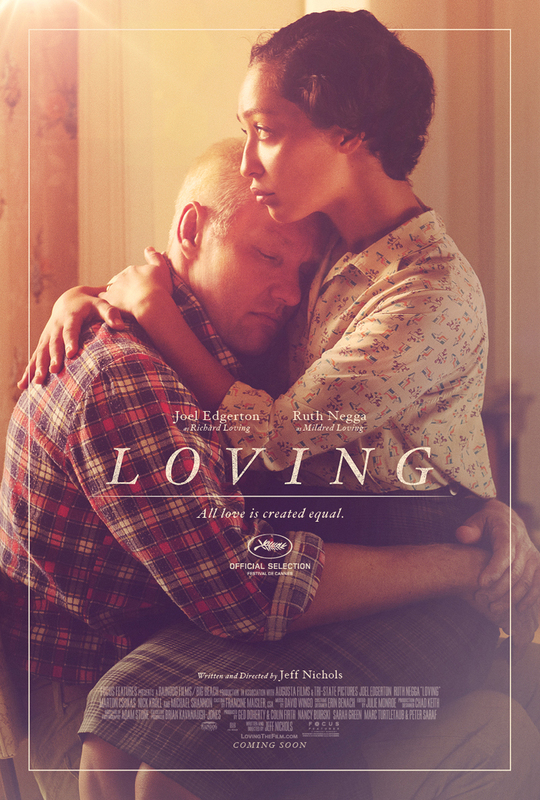 Loving is Nichols most recent film, and it focuses on the relationship between an interracial couple, Richard and Mildred Loving, who struggle to fight against the state of Virginia in the validity of their marriage; this of course is a true-to-life story which happened in the 1950s when miscegenation was considered to be a taboo thing. Richard Loving (Joel Edgerton) is a white man who works in construction in Caroline County, Virginia. He is in love with Mildred Jeter (Ruth Negga), a black woman with whom they share a mutual group of friends. When they learn Mildred is pregnant, the couple decide to marry, but go out of state to Washington, D.C. because of Viriginia’s anti-miscegenation laws. After the marriage Richard buys some land near Mildred’s family and promises to build a home. When someone snitches on the Lovings, Sheriff Brooks (Marton Csokas) arrests them for breaking the law, they plead guilty, and are sentenced to one year in prison. However, the judge suspends this decision, on condition that they not return to Virginia together for at least 25 years. So the Lovings move to Washington until Mildred begs Richard to return to Caroline County, so that Richard’s mother (Sharon Blackwood) can deliver their first child. Arrested a second time, the lawyer is able to clear the charges one more time. Mildred and Richard have two more children and stay in Washington for some time. Mildreds frustration with city life grows, and she writes to the attorney general for help, who directs them to the American Civil Liberties Union. Bernard S. Cohen (Nick Kroll) is assigned and believes they can take their case to the Supreme Court, and effectively remove anti-miscegenation laws nationwide. After an accident with one of the their kids, the Lovings move back home silently and live in a remote area of the state while the case moves along. Profiled by Life magazine at one point, photographer Grey Villet (Michael Shannon) captures them in an intimate moment. When the state of Virginia refuses to set aside the laws, Cohen appeals to the federal Supreme Court. In an-ever-so subtle way, Mildred learns over the phone from Cohen that the Supreme Court unanimously has deemed that interracial marriage is legal in all states. The story closes with the Lovings at home and some titles which tell of how Richard died in a car accident in 1975, but that Mildred never remarried and lived in the house Richard built for her until her death in 2008. Pros: This is very affecting story told delicately and choosing to intentionally focus on the relationship of the couple rather than the messy court battles. That is not to say that Nichols ever lets us forget the real endurance of time the Lovings face as they look for a resolution. Negga and Edgerton embody what a successful marriage looks like. Cons: For all of the excellent performances, set design and cinematography, the film does lack an emotional gut-punch in the middle and at the end. Something similar to the initial conviction and arrest portrayed would have helped engage our emotions better. Points of Interest: Ruth Negga is a child of a mixed marriage. Nichols was able to get the details of the story directly from the Nancy Buirski documentary The Loving Story (2011) and much of the dialogue comes from the documentary which itself featured real-life footage of the Lovings. This film is incredibly particular in what it shares with the audience. We see how their gaze holds upon each other in each instance, how carefully and comfortably they hold hands and embrace each other, the natural fit of their relationship even against all of the challenges they face in the simple act of loving. There is one last thing I really want to emphasize here dear readers. And it is understated in the film. That thing is how despite the clearly demonstrated sanctity and privacy of a relationship which both Richard and Mildred want (and should have), they are willing to take that relationship into the public in order to fight for injustice, but whenever possible they request for opportunities to stay in their home and remind us they won’t bother anyone if they are left to their own devices. A tale of true loving.